Although I appreciate the importance of the logistics that go into covering live sports, I didn’t agree. Fans buy tickets and watch on television to see experts perform their craft. To be the best in the world takes a tremendous belief in one’s abilities in training and the self-confidence to stick to those beliefs in competition. By entering the rink in the order they wanted Brad Jacobs let his team know that it would be their decisions that determined their destiny on the ice that day. Although Sweden ultimately defeated Canada in the championship final, it was that tenacity and confidence that propelled Canada into the final after a lacklustre finish to the round robin tournament. It is these often-unseen mind games that makes sports fascinating to photograph. 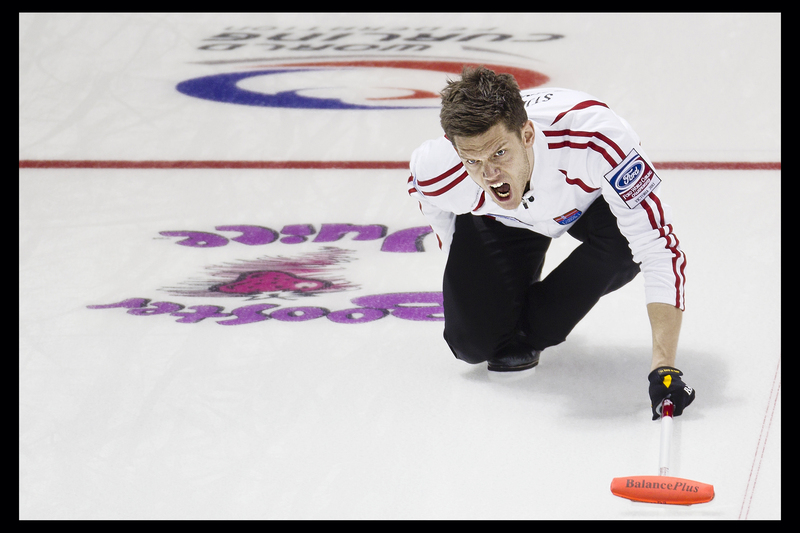 What curling lacks in action, for example, it makes up for in emotion. As a photographer, you can only take so many pictures of a player releasing a stone with his eyes hidden behind shifting brooms before they all begin to look the same. What I find compelling instead is tracking the superstitions and shifting emotions throughout the tournament – from how players hold their brooms to how teammates and competitors interact during and between games. 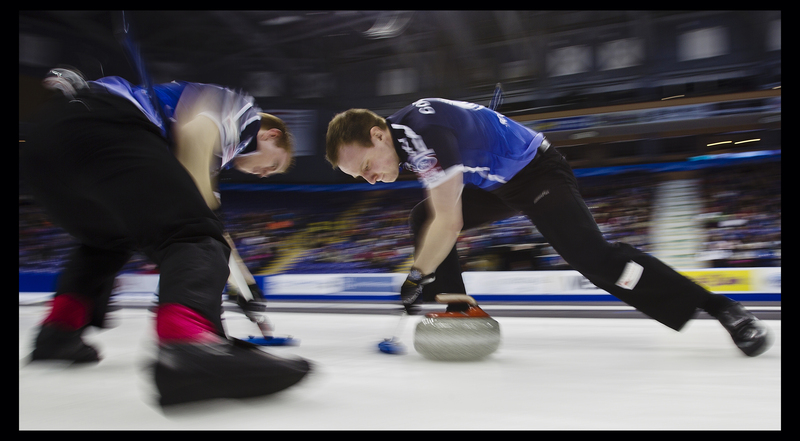 In many ways, the best curling pictures I captured were the moments between the action. Here are a few of my favourites. Norwegian skip Thomas Ulsrud was the alpha male of the tournament. With a strong, confident and powerful air about him, it was his eyes that first caught my attention. Canada’s seemingly unflappable skip Brad Jacobs lets go a scream after scoring three in the sixth end with last rock of the semi-final playoff against Scotland. 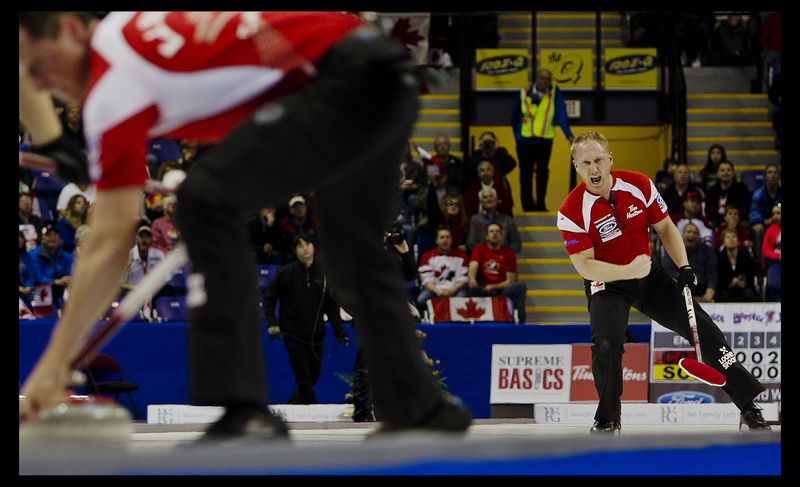 The shot all but sealed Canada’s place in the championship final. 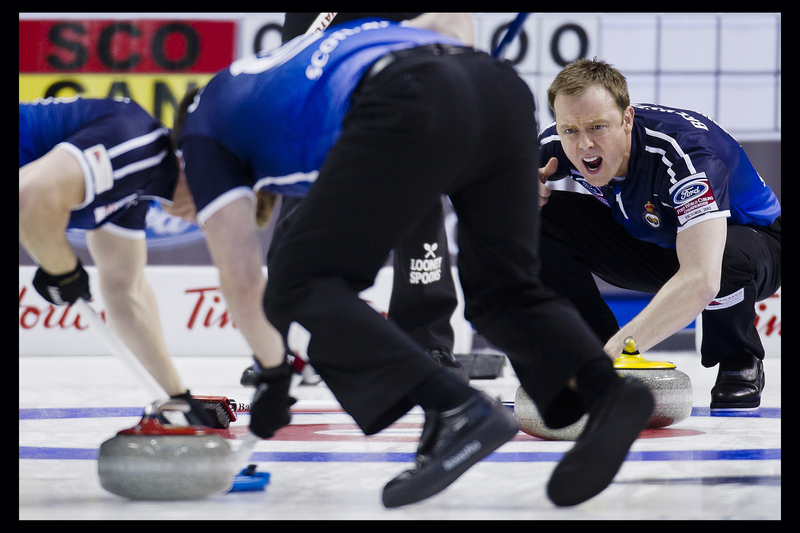 Scotland’s third Thomas Brewster guides a rock into the house by yelling to his sweepers. The more sweeping, the less the rock will curl. 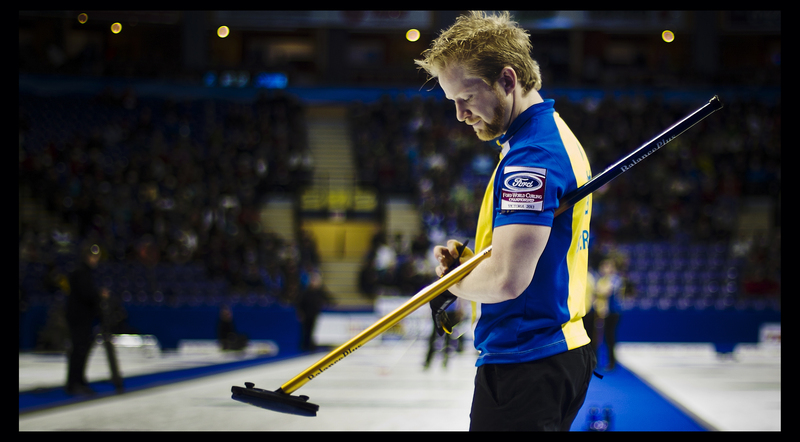 The sweeper’s feet are floating above the ice as he puts his entire body weight onto the broom just inches in front of the rock. I took a lot of photos that froze the action using a fast shutter speed. But as I got more confident with the surroundings I began blurring the action using slower shutter speeds. In this photo, it looks like Team Canada’s E.J Harnden (left) and Ryan Fry (right) are performing an ice dance with their brooms. The victorious Swedish rink joyfully slides down the ice to receive their medals. Sebastian Kraupp, Fredrik Lindberg and Viktor Kjäll are playing to the fans, while their skip and leader Niklas Edin (on the right) is watching his teammates ham it up. Even after the game has been won Edin is still engaged in a leadership role enjoying his teammates emotions rather than the fans. 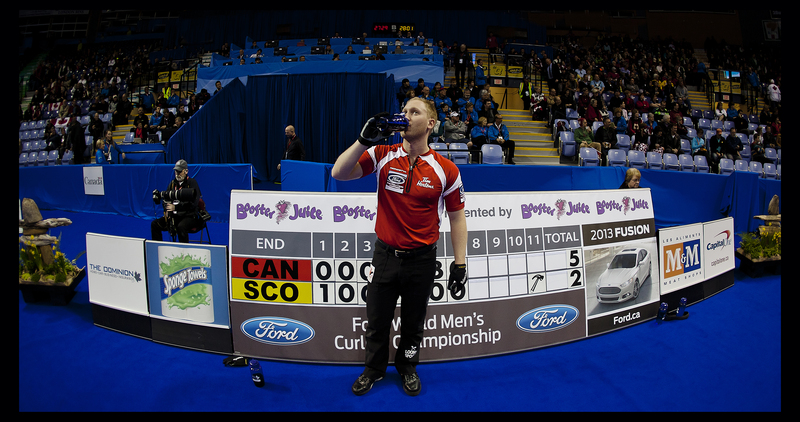 There are many unspoken rules at a curling event. 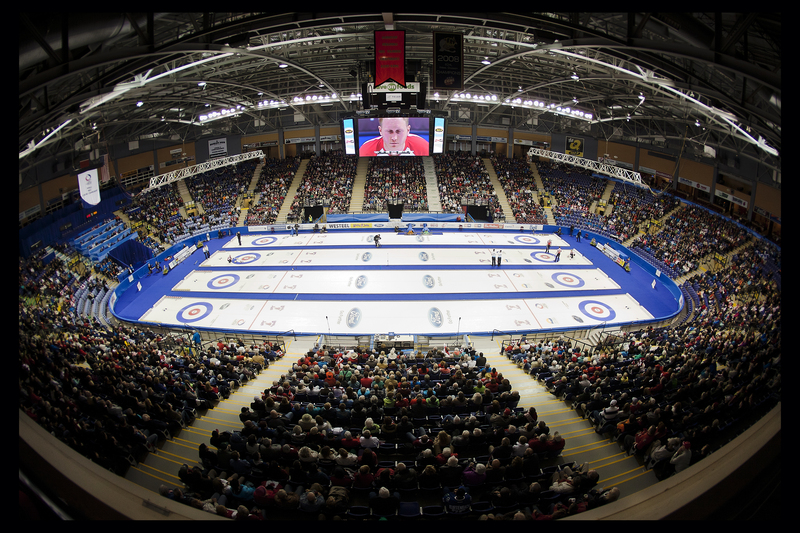 Where you can stand as a photographer depends on the location of the television cameras, and where and when you can walk depends on where the curlers are on the ice. I learned these rules by watching other photographers, asking questions, and – a few times – by breaking the rules myself. For example, I would not have been able to take a shot like this during play as we had to stay behind the scoreboard. However, between ends I was able to shift in front of him and as if on cue he lifted his water bottle and I snapped this shot. Denmark skip Rasmus Stjerne, pictured here, is a interesting character. He led his team to the playoff round – quite an accomplishment for a young 24 year-old curler who just four years ago captured the World Junior Championship for Denmark. I am not a curling expert, but I do consider myself pretty skilled at judging athletic character. Stjerne looks to have the same determination and curling pedigree as his father, who won a bronze medal for Denmark at the 1990 World Championships. I suspect we’ll see his son on the podium in the years to come. 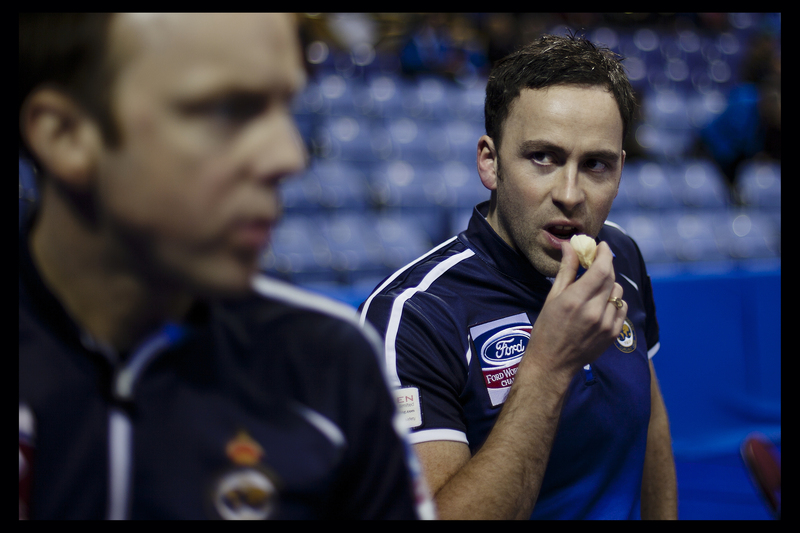 The look that Scottish skip David Murdoch is giving his teammate, Thomas Brewsterat, tells a story – perhaps it has to do with giving up three points to Canada in the semi-final sending them to the Bronze medal match. Scotland is a skilled team with a bright future ahead of them, and won their final match over Denmark placing them in Bronze medal position behind both Sweden and Canada. 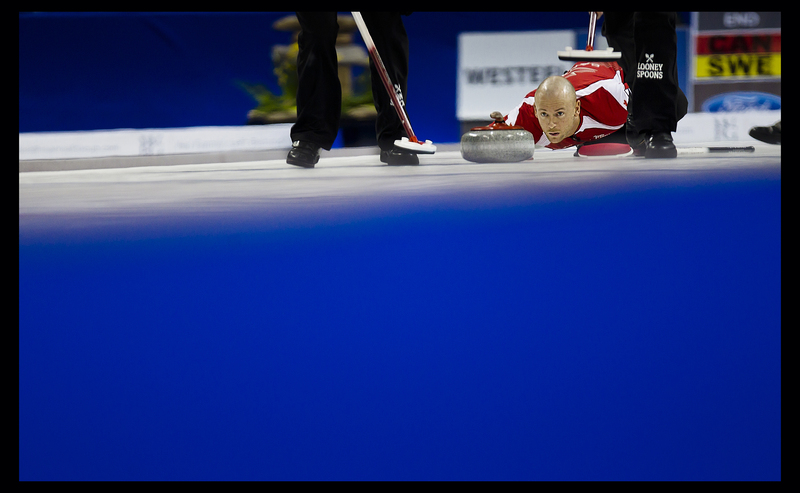 This is a common curling photo of Canadian third Ryan Fry taken from an uncommonly low angle. Sometimes I lay down to getting my camera as low as possible. I was one of the only photographers to do this – either because it doesn’t improve the photo that much, or because it is very uncomfortable to lay on your stomach for so long. 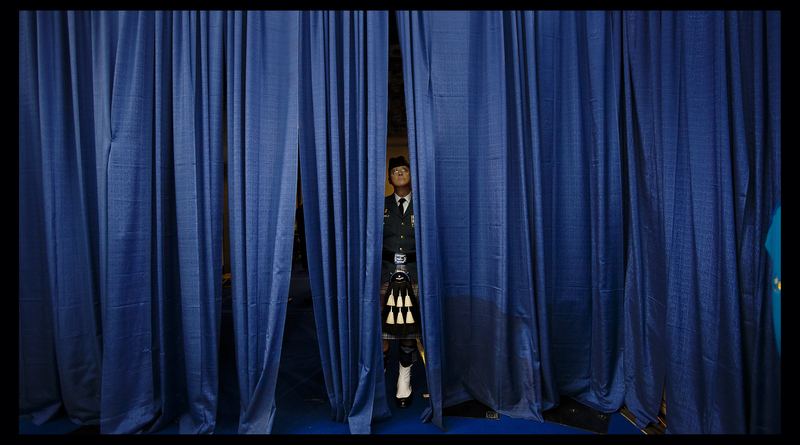 Although this photo offers little visual context, it is a picture unique to a curling event – one of the only sports where you’ll find a bagpiper providing the soundtrack. The photo is filled with blue contrasted with the piper’s bright white socks, collared shirt, and white tassels. It is always good to get a photo that captures an overview of the rink. In this case, it was made even better by a 15mm fisheye lens. I waited until Canadian skip Brad Jacobs was on the big screen and then experimented to achieve proper exposure as the white ice and dark crowd proved challenging. You can also see where the bagpiper stood in the previous photo as well as where the photographers could and could not stand based on where the television cameras were pointing. Getting this shot of the Scottish sweepers was a one-in-200 proposition thanks to the technical and situational variables involved. First, I had to catch a moment when the sweepers were sweeping hard with the stone travelling down the left side of the sheet. Their legs, body, and arms had to be in the correct position so the far curler’s face was not blocked. To capture this perfect moment, the shutter speed had to be fast enough to ensure sharp focus and slow enough to ensure a blurry background. In this case, the exposure time was 1/13 of a second. 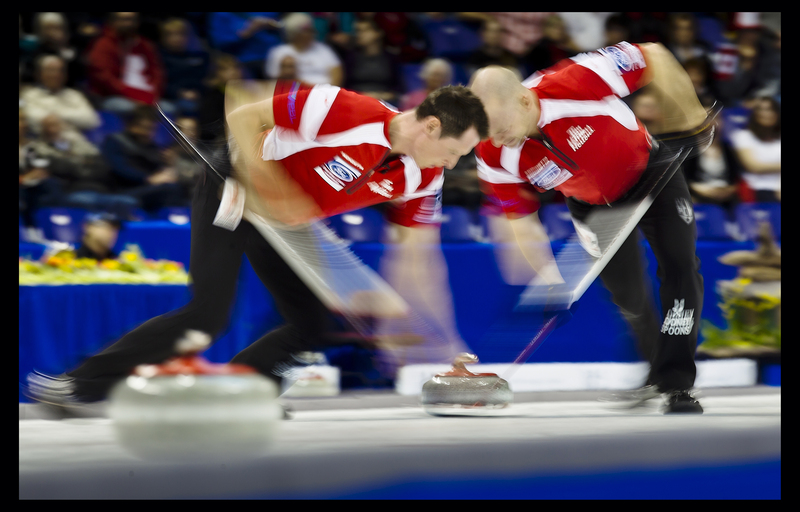 I also had to pan at the same speed as the curlers, while keeping focus on their faces. It took me six ends to get the shot, but it was worth it. The quiet confidence of World Champion Swedish skip Niklas Edin caught my attention in this photo, as did the graphic context with the four bright lights along the top. I can look at this photo longer than any other – but not at a specific part. It is the overall flow of the image that catches my eye, similar to a watching a sunset or staring out at an ocean view. Can’t believe I’ve only found this now. These are fantastic shots. I was drawn in by Thomas Ulsrud’s eyes the first time I saw him during the Vancouver Olympics and have been fascinated ever since. Thanks for seeing what I do.